Buzzing! is the winner of the NS Teachers' Book Award 2015 in the Poetry category; it was shortlisted for the 2013 Royal Society Young People's Book Prize and nominated for the 2013 Carnegie Medal. 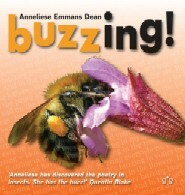 It is a National Insect Week recommended book for children and teachers. Hardbacks are Sold out but Paperback version is available.